An Indiana State University professor co-authored a cover story for the Journal of Physical Chemistry about investigations into buckyball. Guoping Zhang, an ISU associate professor of physics, and two other professors are researching nonlinear optical response and ultrafast dynamics in a nanometer, which is one billionth of a meter, of a system called buckyball. Buckyball is a cluster of 60 carbon atoms, or C_60, which won a Nobel Prize in 1996 for three chemists who discovered it. Nonlinear optical response means when researchers send in a lower energy light that a higher energy light is emitted such as when a green laser pointer is generated from a red laser. "The system that we investigate represents the symbol of nanoscience," Zhang said. "Understanding how things work on a nanometer scale is a big deal, by which we can design new drugs or new functional units or mini-computer robots." They also are researching energy in buckyball as C_60 harvests light energy just as plants. "We use C_60 as a simple system to understand how the light transfers the energy to the system, how the system is heated up and vibrates," Zhang said. "This has a potential impact on photosynthesis." Zhang said the scientists also want to know if C_60 could be used as a new light source that would emit higher energy light. "This means we feed in an intense light and get higher energy light," he said. If the energy is as high as x-ray, then we could use it to examine bone fracture or structure damages." The research was done on the high performance computing systems supported by CIRT at ISU. 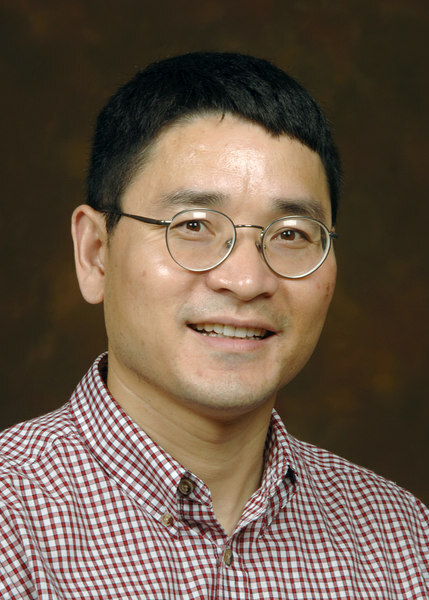 Zhang, earned his Ph.D. from Fudan University in Shanghai, China. He served two postdoctoral appointments at Max Planck Institute for Microstructure Physics in Germany and at the University of Tennessee at Knoxville. His research interests include ultrafast spectroscopy, nanostructures and nonlinear optics. He is a Promising Scholar at ISU. Other authors of the article are Xin Sun, a professor of physics at Fudan University in Shanghai, China, and Thomas George is chancellor and professor of chemistry and physics at the University of Missouri-St. Louis.